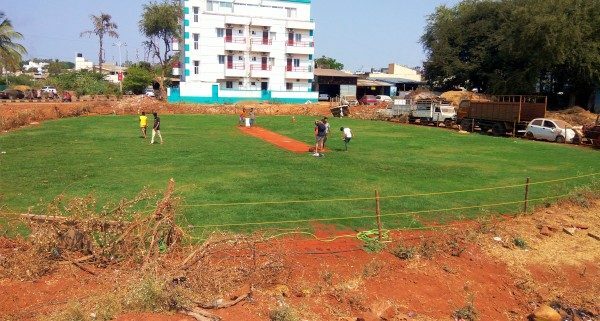 The Mahatma Phule Road Belagavi has new lush green mini ground for cricket with a pitch made by the children and elders of Kore Galli Shahpur on what a barren piece of land and now it will host cricket tournament in the night from March 3. With no ground for the children to play in Kore Galli, they had identified a open private land, which wore a deserted look since several years. Initially they cleaned the bushes and started playing cricket on that land. However as the members of their group increased, so did their interest in playing cricket. But the land on which they were playing was not properly leveled and so created problems while playing. Under the guidance of a few elders the kids decided to level the ground and make it fit for playing cricket. The land owner also decided to hand over the land to the kids as he had no immediate plans for any development there. The 12 guntas land now had marked boundaries, and all the children and youth contributed money for raising fund for establishing a proper cricket pitch under the banner of Kore Galli Sports Club (KGSC), Belagavi. A The members approached several nurseries to purchase required species of grass and planted them on the ground. After two months of efforts now the barren land looks like a ground on which one would love to play, each day it is watered and road rollers used to roll the pitch. Yuvaraj Havalanache, one of the members of KGSC group informed that about Rs 40,000 was utilised for establishing the cricket ground. He said that every member of the group has his efforts in giving birth to it. He said for the same, 32 teams from various parts of Karnataka, Maharashtra and Goa are expected to participate.